When it comes to measuring academic achievement in schools, class size is often a hot-button topic, particularly at the primary school level. It’s here that students build skill sets for future learning, and where to some, class size is of the greatest concern. In recent years, researchers have suggested that smaller class size results in higher academic achievement and higher test scores, but does it? So, how does class size affect student achievement? In theory, fewer students per class should allow a teacher to give more attention to each child, and common sense tells us that this is true, but what does the research say? Using research that spans over twenty years, and observing test subject groups for over ten years, researchers have been able to turn their accumulated data into conclusions. In a 1977 study, researchers compared the class size and test scores of 4th and 8th graders in over 380 school districts and found strong relationships between class size and student achievement. This research found that 4th graders with lower student/teacher ratios had higher math scores, and 8th graders with lower student/teacher ratios had a better school social environment, which they concluded lead to higher achievement. Data garnered from more than 800 school districts in the Texas Education System compared to class size to test scores and found that student achievement dropped when the student-teacher ratio increased above 18 to 1. Tennessee’s state-wide Star project found that the learning advances made by students with a low student to teacher ratio (A ratio of 13-17 students to 1 teacher) not only benefited students while participating in the study, but the advances followed them through later years even when class sizes moved back to average size. Serve, a federally funded regional educational laboratory in the Southeast U.S. participated in a study for class size reduction in the late 90’s. In all cases, the student gains in math and reading increased significantly. The interaction between students and teachers, as well as students to students, was also observed. Classroom and lunchroom activities were more relaxed and organized with smaller class sizes. Research tends to support the belief that smaller class size is beneficial to students and their academic achievement, but not all studies have shown that students learn more in smaller settings. A new study finds that Florida’s 2002 constitutional amendment mandating a reduction in class size in districts throughout the state, had no discernible positive or negative impact on student achievement. In response to the Tennessee Star study, one researcher later suggested the possibility that teachers in the study, knowing they were participating in an experiment, may have taught their students differently. That perhaps the teachers thought that if the results were successful it could persuade the legislature to make class size reduction a statewide priority. Still, others contend that mandating small class sizes is not a magic bullet. For example, reductions will never benefit the students of poorly performing teachers, regardless of how few students they have in their classroom. Other findings suggest that reducing class size is not the only solution to increasing student achievement. 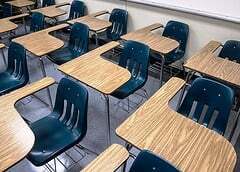 Does Class Size Affect Student Achievement or Are There Other variables to Consider? Weighing the benefits of smaller class sizes versus cost has been an ongoing debate for decades. 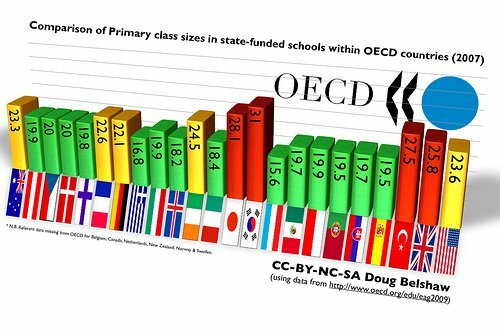 There are those who claim smaller class size does not affect achievement, and point out that increasing the pupil/teacher ratio by just 1, could (collectively) save schools at least $12 billion per year in teachers’ salaries. These types of savings can make financial sense for cash-strapped districts. (Source: Brookings Institution). Others believe that instead of automatically defaulting to lower class size, perhaps there is more merit to replacing teachers whose students continually underperform, or whose teaching skills are proven subpar. The premise being, that elevating not only the material being presented but also the quality and effectiveness of the teacher presenting it, is what will lead to better student achievement outcomes. (Source: Education Next). Regardless of where you fall in this debate, it’s important to know that even if a school district wants to decrease the teacher-pupil ratio, they often face internal constraints that may prevent them from moving forward with their plan. 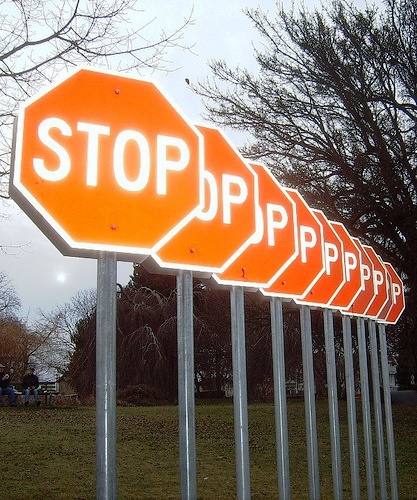 Having space and funds for those extra classrooms and teacher salaries are major budgetary roadblocks. Also, these types of capital projects take years of planning and time before they become reality. 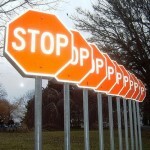 What’s a School District to do? We can’t help you find the extra cash for an addition, mobile classrooms, or to build a new school, but we can give you our knowledge and experience. If your district doesn’t have the money or time to build new or add-on, then perhaps using your existing space would be the best, fiscally responsible option. 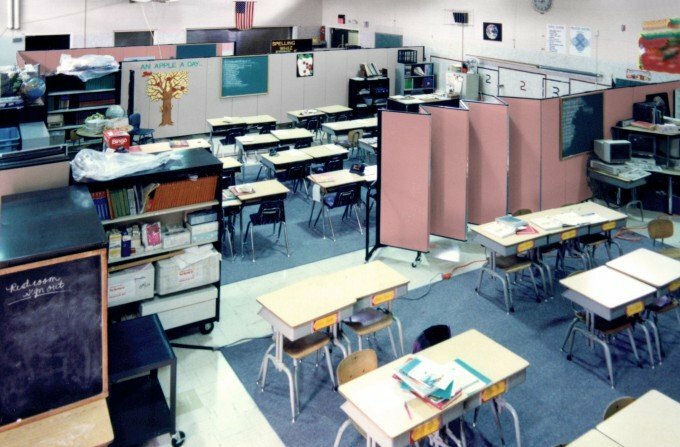 School districts can use their existing space to create smaller classrooms by setting up portable walls to divide classrooms. Create a private place for reading, test taking, or conducting separate activities without distraction. Larger rooms can also be divided for use as Shared Teaching classrooms. And if time and space are an urgent priority, our room dividers can easily be used to create classrooms in areas such as lunchrooms and gymnasiums. And the best part is we do all the planning for you, and it’s a completely free service! 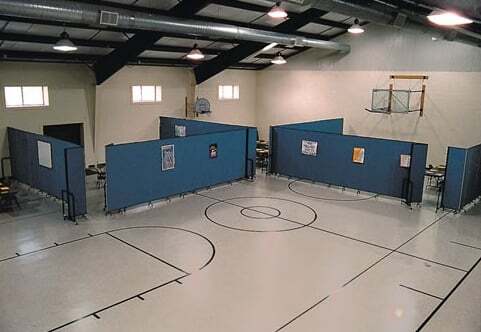 Unlike mobile classrooms, temporary walls, or stationary dividers, Screenflex room dividers are completely portable, tackable, and sound absorbing. Screenflex dividers are available in 36 different lengths and heights, and 6 fabric styles, and 39 fabric colors, to fit every need. And because they’ll fit through any standard doorway, when not in use they can easily be collapsed and stored away, or quickly repurposed for other needs. 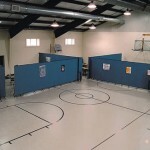 When you choose Screenflex portable room dividers, your decision to reduce class size couldn’t be made any easier!